The game of roulette is one that is popular among gamblers, both online as well as within land-based casinos. Roulette rules are easy to follow and with roulette basic strategy, you can hopefully see a profit during gameplay. Learning how to play roulette at a casino or online will provide beginners with insight into the game’s mechanics, allowing you to easily find a new casino game to enjoy. You will find out that roulette is an exciting game, as a player’s heart will begin to race as soon as the ball drops. If the ball lands on your chosen number, you win! As a newbie to the game, with proper roulette tips, a profit can be made. But first, you must understand the history of the game, know where to play, how to understand basic bets and payouts, plus strategy. With this information, you will be able to conquer the roulette table and hopefully turn a nice profit! There are many ways in which you can play the game of roulette. Knowing where to play will allow you to find the best games for your gaming preference. Playing roulette online is one option while you can also play at land-based casinos. Practice roulette online for free at top online casinos to learn how to play the game before you begin betting for real money. Roulette in land-based casinos comes in many forms, such as American and European. Roulette in Vegas is a go-to game for many who want to enjoy an exciting casino game while in Sin City. When it comes to playing roulette, the best option is playing roulette online for real money. The best roulette online casinos will offer you quality gaming options as well as the ability to play for free. Practice for a while before you play for real money, getting a feel for the game. This is one of the many benefits of playing roulette online. With an online gameplay, you also have access to more variations of the game, quality betting limits and even live dealer options. 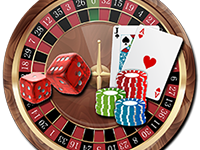 Enjoy a live dealer game of roulette to feel as if you are at the casino but in your home! Choosing online roulette allows you to enjoy the game in comfort and convenience. When it comes to roulette gaming, most online casinos offer their services to regions other than the United States. Despite this fact, there are a few online casinos that provide access to residents in the US. Roulette gamers will find quality options at such online casinos as Bovada, BetOnline, and LasVegasUSA. European and American roulette are common versions on offer with live dealer sometimes in the mix. Easily play for real money or search for practice mode to check out the game format before wagering. The best US-based roulette online casinos will offer quality games plus methods of deposit and withdrawal that work for US players. Quickly make a deposit and begin wagering with ease at top rated online casinos offering services in your region. As mentioned above, most online casinos offer roulette gaming internationally, in areas such as Europe and Asia. These countries are much more open to online gaming. Operators of online casino sites have more opportunity to obtain licensing and provide their services to customers. Learning how to play roulette is simple. The rules of roulette are basic and with a little time, you can learn how to play the game with ease. Play roulette for real money against live dealer once you know the rules and you will hopefully begin to earn a profit. Roulette is actually one of the easiest casino games to play. Depending on the version you play, the roulette wheel will have 37 (European) or 38 (American) pockets. The stops are numbered 0 to 36 with the American version having a 00 pocket. Each pocket is colored red or black, with zeroes being green. You will place your bet based on an individual number or any combination of numbers. The croupier or dealer will then spin the ball in the outer rim of the roulette wheel. The ball will fall into a numbered space and if you choose the right number, then you win your wager! It’s that simple! Rule 1 – Know the Table Minimum: Each roulette table will have a minimum bet. Know the minimum of the table before you sit down. You don’t want to sit down at a table with a $100 minimum when you plan on spending far less. Rule 2 – Understanding chip color: When playing roulette, every player will have different color chips. This is to help differentiate from player’s wagers. Know that the color does not dictate the amount. Amounts are set in denominations such as $1, $5, $25 etc. Rule 3 – Place your wager at the right time: Wagers must be placed before the dealer spins the wheel. Players will be allowed to place a wager after the spin until the croupier calls off all bets. Rule 4 – Understand the Types of Bets: In general, bets offered in roulette are known as inside bets and outside bets. With an inside bet, you are going to place a wager on a single number. An outside bet will be one that covers a large group of numbers. Rule 5 – Set a limit: As with any gambling game, be sure to set a limit. You want to have a set amount you plan on wagering, and stick to it. Know ahead of time how much you plan on spending and stick to your budget for smart gambling. Understanding the roulette wheel layout is important when it comes to playing the game. There are two standard variations of roulette; American roulette and European roulette. With the European version, the roulette wheel includes a single zero while the American version includes the double zero along with the single zero. Each of the roulette wheels will have 18 black and 18 red pockets with the numbers 1 to 36. With American, the zero and double zero pocket will be green and the European version has the same coloring with only a zero in green. Bets are placed on the roulette table to coincide with the roulette wheel, trying to dictate where the ball will land. Each roulette game offers a different house edge. With American roulette, the house edge is around 5.26% while European roulette offers a lower house edge at 2.70%. You will have a better chance of winning by playing the European version due to the lower house edge. When playing the game, the best way to play is with a winning roulette strategy. The best roulette strategy will ensure that you play the game without making haphazard bets and hopefully turn a profit. Roulette strategy that wins focuses on the house edge and how to make money playing roulette. Strategy 1 – Always choose European Roulette: This is a must when it comes to roulette strategy. Not only is the house edge lower but you may have the option to use ‘la partage’ rules. This will allow you to win back your money or lose even money bets when the ball lands on a single zero during the game. The rules will vary depending on where you play. Strategy 2 – Know which bets to avoid: When considering your strategy, it is important to know which bets to avoid. In American roulette, you want to avoid a top line or basket bet. This covers 0-00-1-2-3. This bet will only be offered at a table with a higher house edge. Strategy 3 – Know the Minimum Bet: It is important to know the minimum table wager. If you have $200 to wager all night, you want to avoid the $100 minimum tables. Strategy 4 – Proper Money Management: When playing roulette, be sure to practice proper money management. Set a budget and stick to it, practicing responsible roulette gaming. Strategy 5 – Remember to Have Fun: The point of roulette is to have fun and enjoy the excitement. Go in knowing you are playing the game for fun instead of trying to turn a profit. Any winnings are a bonus! When it comes to roulette, players want to place roulette bets that will provide a payout. And while the outcome of the game cannot be predicted, if you learn more about the bets and payouts on offer, you can make the best decision when wagering. Inside and outside bets provide you with various options for wagering and by learning the roulette payment from bets, you can figure out the best way to enjoy the game. From red and black bets to evens/odds, lows/highs and dozens, there are several options for wagering that can lead to a higher chance of winning. A roulette calculator is a handy tool that can help you figure out the payouts, making it easier for you to choose your best bet. 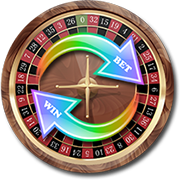 Roulette Payout – Red or Black: With this bet, you are wagering that the ball will land on a pocket that is red or black. There are 18 red pockets and 18 black pockets. If the ball lands on the color you have chosen, you win! Roulette Payout – Odd or Even: With this bet, the player is wagering on one of the 18 odd numbers (1, 3, 5, etc.) or an even number (2, 4, 6, etc.). If the ball lands on even and you choose even, then you win. Roulette Payout – Single Number: This bet is on an individual number, including 0 or 00. You place your chips inside the number box. If you hit the single number bet, then you win a payout of 35-1. Roulette Payout – Split: With this wager, you are betting on two numbers. This wager pays 17-1. You make split roulette bets by placing a chip on the line between the two numbers on the table. Roulette Payout – Dozens: With this bet, you are wagering on the first 12 numbers, second 12 or third 12 to pay 2 to 1 odds. The house edge in roulette is the amount the casino will take during gambling based on a percentage. The roulette odds of winning are based on the house edge, which will vary depending on the game you choose to play. Understanding the roulette house edge can help you choose the right gaming strategy and which game you wish to play. European roulette has a much lower house edge than American roulette, which means you have a better probability of winning with the European version than the American one. Essentially the roulette house edge explained is in number form. It is the casino’s average profit from a player’s wager. If the house edge in a roulette game was 5%, then for every $1 wagered, the casino could keep 5 cents and the player would earn $0.95 as winnings on average. Strategy 1 – Play European Roulette: American Roulette is fun but European offers the best odds for the player. European Roulette has a house edge of 2.70% while American is set at 5.26%. Strategy 2 – When playing American roulette: Avoid the Top Line Bet. This bet has a casino edge of 8%, which means less probability of a return for you. Strategy 3 – Avoid the 5 number bet: Never wager on 0-00-1-2-3 as this bet has the worst odds on the roulette table. Learning how to play roulette and win is essential to having fun and avoiding mistakes. Whether you play roulette in a casino or online, knowing the rules of the game, learning more about strategies and managing your bankroll will ensure that you are successful or at least have fun while playing roulette. Information on how to play roulette for beginners should include terminology such as bets to be made and the variations between such games as European and American roulette. By learning as much as you can as a beginner, or even intermediate player, you can avoid unfortunate mistakes. As with any casino game, mistakes will be made. Thankfully, gamblers can learn from common roulette mistakes and avoid them. Casino pit bosses can provide quality insight into common gambler mistakes. Often, casino pit boss confessions will consist of roulette mistakes such as going over budget or placing the wrong bets. Roulette dealer mistakes can even lead to players losing money. It is important to learn the worst roulette mistakes you can make so you can enjoy gameplay instead of feeling defeated. Roullete Mistake # 1 – Playing before learning about various games: This is a big mistake. Players should learn more about the variations of roulette, such as American, European, French and mini. Learning more about each game will allow you to know the house edge and how to play each game, giving yourself the advantage. Roullete Mistake # 2 – Not Setting a Budget: Roulette is an exciting game and can easily pull players in without much thought to a budget. Always have a budget in mind and set limits to your gameplay. Roullete Mistake # 3 – Start Small: When playing roulette, choose a table with a low house edge, such as European Roulette and then place small bets until you have experience and confidence to place higher wagers. Roullete Mistake # 4 – Too Many Bets: It’s easy to place too many wagers on a single game and then end up losing all your bankroll quickly. Start with even money bets to get the most out of your money, which will help you continue to play for an extended period of time. Roullete Mistake # 5 – Avoid Using Betting Systems as a Beginner: As a newbie to roulette, avoid trying to use a betting system until you have more experience. You want to develop your skills within the game and then build a bankroll to place larger bets in time. Play roulette for real money online when you want to have easy access to casino gaming with more variants, better payouts and the opportunity to practice for free! Learning how to play roulette online casino games is easy. Select a top online casino that offers free demos, so you can check out the roulette variants on offer and practice your game play. Once you feel comfortable, you can make a deposit and begin playing for real money. Online casino roulette with live dealer is an option as well, providing the online casino you choose offers this gaming type. With live dealer games, you get the experience of a land-based venue watching the beautiful dealer spin the wheel while in the comfort of your own home! Always remember that some rules for land-based casinos will not apply to the online casino roulette games. Be sure you understand any terms and conditions plus rules of the game before you begin. When logging into the game lobby, you will find there are many variations of roulette at online casino sites. Roulette game variations keep game play interesting. At the best casinos, you will find roulette games for real money in several variants including European Roulette, American Roulette, French Roulette, Mini roulette and Marvel roulette. Each of these games offers a specialized experience, with various minimum and max bets plus unique rules to keep your time online interesting. One of the best advantages to roulette gaming online is that you can play for free. Practice roulette online for free at your favorite casino, such as Bovada, before you make a real money deposit. At Bovada, you can choose your roulette game, click play now, then practice play. You can then play online roulette for free and practice your game before wagering real money. Spend as much time as you like getting a feel for the game, practicing your strategy and having fun before putting your money to the test. One of the most popular ways to enjoy roulette online is with live dealer gaming. Top online casinos will offer live dealer roulette, where the game play takes place live. The online casino will stream footage of the game as it happens in real time. You make decisions in real time as well and interact with other players plus the dealer from the comfort of home. Roulette with live dealer allows players to feel like they are at the casino without having to go anywhere! Finding a reputable online casino for roulette is essential. Players need to learn how to pick a trusted casino to play roulette online in order to ensure game play is fair and secure. It is important to find an online casino for real money to play roulette, where you know that your personal information is secure as well as offering safe financial transactions. To do this, do your due diligence. Such sites as CasinoMeister and AskGamblers offer quality reviews of online casino sites, helping you to determine the best option for your real money roulette play. You want to be sure that the site you choose is legit, offering services in your area, ensuring fair and secure game play as well as deposit and withdrawal options. Learning how to play at online roulette casino is easy. You can learn how to play for real money below by following a few simple steps. Step 1 – Sign up for an account at a reputable online casino: Find a quality online casino offering real money game play in your area and create an account. Step 2 – Make a Deposit: The next step is to make a deposit. Use methods available to your area such as Neteller, Skrill, debit or credit cards to make a deposit. Check for any bonus options involving roulette so that you can earn extra cash while making a deposit and enjoying your favorite game. Step 3 – Find a Roulette Game: Check the table game section of the online casino to find a roulette game you wish to enjoy. European, American, and French are the most common forms of roulette found at online casinos. Step 4 – Be sure to read the online casino roulette play rules before you begin: You should be able to find the rules of the game or the FAQ section of the site. You want to ensure the rules are similar to what you are familiar with to be able to play correctly. It is helpful to play for free in demo mode to get a feel for the game before starting real money game play. Step 5 – Place your Bet: Once you are ready to play, place your bets. The roulette table clearly offers standard betting options as well as denominations for you to choose. Pick your amount, choose your bet and spin the roulette wheel. Bets on offer can include 1st 12, 2nd 12, 3rd 12, red, black, odd, even, 1-18 and 19-36. Step 6 – Claim Your Winnings: Once you earn a profit, you can easily make a withdrawal. Click on the cashier and check your options for withdrawal. For the most part, the option you chose for deposit can also be used for withdrawal. Your choices will be based on where you are located and what the online casino provides. The history of roulette is quite interesting. The game dates back to the 17th Century with a Frenchman named Blaise Pascal being credited with the invention of the game. Pascal was reportedly trying to create a perpetual motion machine and as he was studying probabilities he was able to come up with the roulette wheel. Over the centuries, the game has grown in popularity, available in both online and land-based gameplay. Playing roulette for real money can be quite fun and also a game that players sometimes try to take advantage of. Like other casino games, it is not uncommon for cheating in roulette to take place. Cheating takes place in any casino game unfortunately and roulette is among such games. In roulette, past posting is one way in which players will cheat. With past posting, the player changes the amount of the bet after the outcome is known. This can be hard to do as the dealer is supposed to be always watching. However, players do get away with it from time to time or caught in action.